For a man with such conventional tastes and views, George V had a revolutionary impact. Almost despite himself, he marked a decisive break with his flamboyant predecessor Edward VII, inventing the modern monarchy, with its emphasis on frequent public appearances, family values and duty. 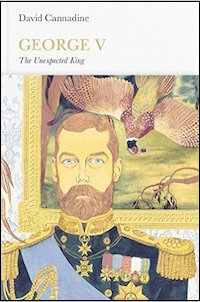 George V was an effective war-leader and inventor of 'the House of Windsor'. In an era of ever greater media coverage—frequently filmed and initiating the British Empire Christmas broadcast—George became for 25 years a universally recognised figure. He was also the only British monarch to take his role as Emperor of India seriously. While his great rivals (Tsar Nicolas and Kaiser Wilhelm) ended their reigns in catastrophe, he plodded on. David Cannadine's sparkling account of his reign could not be more enjoyable, a masterclass in how to write about Monarchy, that central—if peculiar—pillar of British life.